My personal experience with foraging for edibles is it can be very hit or miss. Just because a particular plant is edible, doesn't mean it is tasty! Many of the edible wild greens you can find in the woods or road side are too bitter for my palate. After the apocalypse and food is scarce, I'll be glad to have my list of wild greens but until then I'll stick with foraging for the tasty treats. One such treat might take no foraging at all. In fact you may have it in your garden already, masquerading as an ornamental. 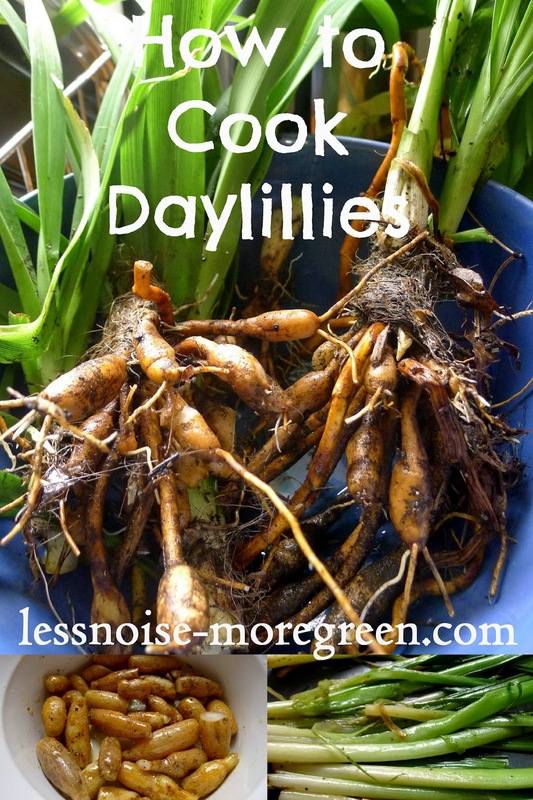 All parts of the lowly daylilly are edible. In the spring, however, before the plant matures and flowers, the edible treats are the young shoots and the fat tubers. I treat the shoots, in terms of cooking, like they are leeks. Chop off the bottoms and most of the dark green foliage then slice them in half long ways and rinse. My favorite way to eat them is sauted like this in a little butter until cooked, then seasoned with salt and pepper. The shoots are succulent, flavorful and absolutely delicious! For the tubers, I roast them like any root vegetable. Remove the tubers from the plant, top and tail them and give them a good scrub. Dry them off and preset the oven to 400 degrees F. Toss the tubers in a little olive oil with salt and pepper and roast them for twenty minutes or so, depending on the size of the tubers. Once the tubers are crisp on the outside but soft in the middle they are done. I think they taste like a cross between a potato and a parsnip. Eat them as a side dish if you have enough or as an addition to a roasted vegetable medley. Have you tried eating daylillies? What did you think?